The links below are for the Tekkit server only. The links below are for the Reloaded server only. We are a great community where we love building amazing things and have a great time doing so. We have been up and running for about four years now. Our owner hosts both servers on his dedicated network so there are no server costs, which in turn allows us to not to need donations. We thrive on being a great community that won't accept donations for any reason. We want this to be a fun environment where anyone can play as long as they follow the rules! Thank you for taking the time to sign up on the forums so we can hear your opinions and suggestions. We hope you have a fantastic time here at The Condemned. Our new server Condemned Reloaded is now open! or on the technic launcher search for http://api.technicpack.net/modpack/texit-reloaded in the launcher search box. After a year and a half, the Tekkit server has had its long overdue map wipe. All worlds were reset along with player inventories and money. The only thing players get to keep is their rank from the last map. We will make the previous map available for download at a later date. Player Shops will be closed until further notice. Download Link for last map! -> https://drive.google.com/open?id=1BOnpagrn5g5qw4WlA-RRjBWAfsvkEHnC If you're trying to open the map in singleplayer, unzip the downloaded file into your saves file in your tekkitmain directory. Post any questions pertaining to the reset in the comment section. [Member] SolidFeather Will there be the Pig Launcher again? Happy Holidays. We at the Condemned staff Team, Hope you have a happy Christmas. 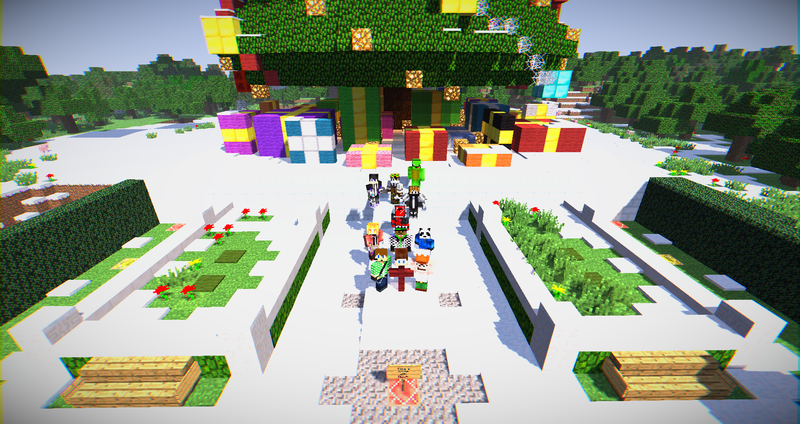 to celebrate Christmas we have decorated spawn with Christmas themed items such as Christmas tree and candy canes. Hope you have a wonderful Christmas. [Member] AnitaDrink Anyone have a magnifying glass? Staff will be taking a break this month! The player base will need to help itself overcome any problems they might find. However, This does not mean that it is ok to break rules. You are free to still ask the ex-staff for help as they still have lots of experience but they will not be able to help with anything more than a regular user.